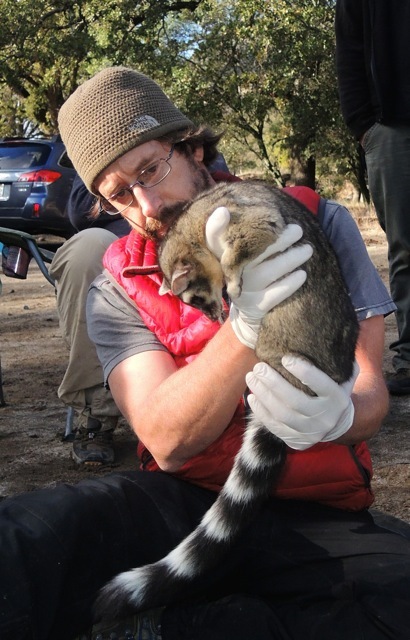 Dixie is an adult female ringtail that we first captured in April 2014 and then recaptured on November 1, 2014. During the November capture, she received a radio telemetry collar so that we can track her during the winter months. One of our first actions was finding her den. 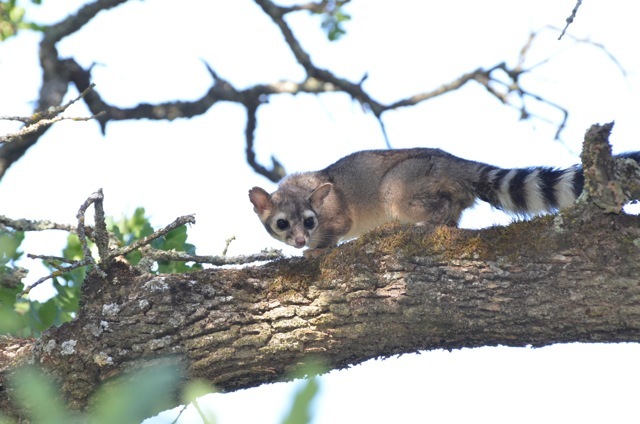 In nearly all of the other ringtails that we’ve tracked, the ringtails have regularly switched den locations and didn’t use a particular den for multiple consecutive nights. Dixie apparently is an exception…her den appears to be remarkably perfect for a ringtail! It is in a rock face surrounded by trees and shrubs that have an abundant food supply, is secure with an opening that goes back about 2.5-feet and is only 3-inches wide (predator heads, claws, and talons can’t reach a sleeping ringtail in this den), and has an incredible view. Once I realized that she was using this den regularly, Scott Newton and I put up an infrared video camera pointed at the den and checked it after one week. Dixie was continually returning to this den during the week. Here is a compilation video of her comings and goings from November 12-19.